It takes around 3-4 years before a bush produces its first harvest, but it takes 7-8 years for the bush to produce the optimum yield. A bush only produces around 0.5 kg of finished coffee per year. The coffee bush is highly sensitive to cold and therefore requires an even and warm climate. The finest coffee comes from plantations over 700 m above sea level. The berry of the coffee tree, which is about the size of a cherry, is a stone fruit. Each berry usually contains two coffee beans, called flats. However a berry may instead contain just one bean, called a peaberry. It takes 8-9 months for the coffee berries to ripen. Generally, the longer the ripening time, the better the coffee. Although mechanical pickers do exist, most coffee is still harvested by hand. There are two main methods of extracting the bean from the berry: the wet method and the dry method, which give the coffee a different character. The wet method is used mainly in locations with good reserves of water, e.g. Central America and Colombia. Once the berries have been trimmed of leaves and stalks, they are immediately threshed to remove the skin and pulp. Then they are left to ferment for 12 to 36 hours. This fermentation gives the “washed” coffee an acidic character. The next step is to wash and rinse the beans in running water before they are dried. The beans have the parchment skin intact and are called pergaminos. This membrane is threshed off before the cleaning and sorting. The dry method is used where access to water is limited, e.g. in Brazil. Immediately after harvesting, the berries are trimmed of leaves and stalks. The berries are then rinsed in narrow channels of running water. At this point unripe berries are also separated from the ripe ones. The coffee berries are then laid out on cement or stone terraces to dry in the sun. They are turned several times a day for even drying. At night the berries are shovelled up into heaps and covered. After 1-3 weeks, the berries are dry and the pulp has become dark and wrinkled. The dry pulp and the parchment skin are threshed off before the cleaning and sorting. The beans are cleaned mechanically to remove any remaining bits of skin, as well as split, underdeveloped or discoloured beans. Sometimes cleaning is still carried out by hand. Finally, the beans are sorted by size and other properties that have an impact on the quality. Since the raw coffee varies in flavour from season to season and across the harvesting year, samples from the coffee-producers determine which consignments are to be purchased. When the raw coffee then arrives, it is tasted again for a decision on the proportions in a blend. The coffee taster judges the appearance of the raw coffee and factors such as smoothness, purity, aroma, acidity and body. Usually the best results are achieved by blending coffees with different characteristics. Brazilian coffee has a mild flavour and works well as the base in a coffee blend. The blend is then built up with more aromatic and acidic coffees, chiefly from Columbia, Central America and Kenya. As the beans are roasted, the substances that give the coffee its special flavour are formed and released. If the beans are roasted too much, the flavour is bitter and acrid, with no aroma or body. If the beans are roasted too little, not all the aromas develop and the coffee ends up too weak. We have made it our signature to roast the beans carefully to achieve the best flavour and strength for the coffee. Different preparation methods demand different grinds. The contact time between the coffee and the water determines how coarsely ground the coffee needs to be. The longer the contact time, the coarser the grind required to get the best flavour and aroma from the coffee. Coffee is highly sensitive to oxygen in the air. It is therefore important that it is packaged in an oxygen-free environment and in packaging that provides a good barrier. The coffee can either be vacuum packed or packed in a protective atmosphere, e.g. pure nitrogen. Properly stored, coffee will keep for 10-14 once the pack has been opened. Store the coffee in a dry, cool place, preferably in the fridge, and well sealed in its original packaging, to best retain the flavours. A storage jar with a tightly fitting lid will also help, but do not pour the coffee into the jar. Place the whole pack inside it. If coffee is exposed to air, light and heat, the flavours are destroyed in as little as an hour or so. 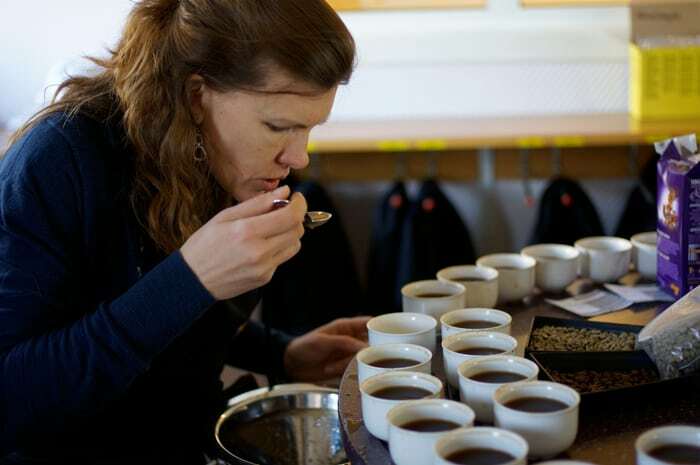 Löfbergs was founded in 1906 and is now one of the biggest coffee roasters in the Nordic region. We remain a family-owned company, now in its fourth generation. Our head office is situated in Karlstad, in the heart of Sweden, where we also have one of our roasting houses.